It’s hard moving into a bare house. There’s nothing more discouraging than dusty rooms and empty walls. Even if you were careful budgeting your move, you probably spent more money than you intended to on gas for the truck, moving boxes, etc. Here are some tips on how to spruce up your new place, especially if it’s small. You don’t necessarily need to spend a lot of money to have it looking great! 1. When buying new furniture, remember to of course check websites like Craigslist for bargains. 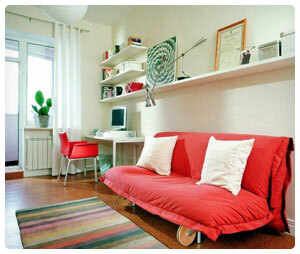 Keep your eyes open for armless chairs and sofas because they add space to small apartments. They’re a smart way to give the illusion of an uncluttered room. 2. Add color and keep it as coordinated as possible. There’s nothing worse than a small and dark, dreary apartment. Try not to make the colors jarring—no purple and orange, for example. Remember to keep it fun, though! Don’t overthink things because the coolest homes have personality, not the perfection that comes out of a home decor magazine. 3. Deceive the eye into thinking that your small apartment is a lot bigger than it is by adding floor length mirrors where applicable. If you have curtains, consider extending them from ceiling to floor, which emphasizes the length of the room. 4. At the same time, make sure to draw the eye downward as well. Add colorful rugs, potted plants, or a strategically placed glass coffee table. 5. It’s all in the details! Buy some nice pillows for your armless chairs and sofas. Spread some candles around the apartment—at night especially, they’re great for mood lighting. If you have photos to display, invest in nice picture frames so that they can function doubly as decorations and warm memories. 6. Anyone with a small apartment will tell you to be smart about space. Furniture that offers storage benefits, such as an adjustable ottoman, are key. You can use it to pack blankets, DVDs, or whatever else you might need in the living room. Then just put the cover back on, scoot it closer, and prop your feet up in time for the football game! 7. Use your wall. You can buy hooks and hang everything from your knife collection to your pots and pans. It’s a clever way to maximize room in a small apartment because you probably don’t have that cabinet space in your kitchen. Learn more about decorating your new place.